Hair loss is a common condition that affects both male and females. It can manifest as a receding hairline, thinning through the part or crown, or diffuse hair loss. While not a life threatening condition, it can be embarrassing and affect the quality of life for those experiencing it. Platelet Rich Plasma (PRP) is obtained by putting one’s own blood into a special centrifuge. 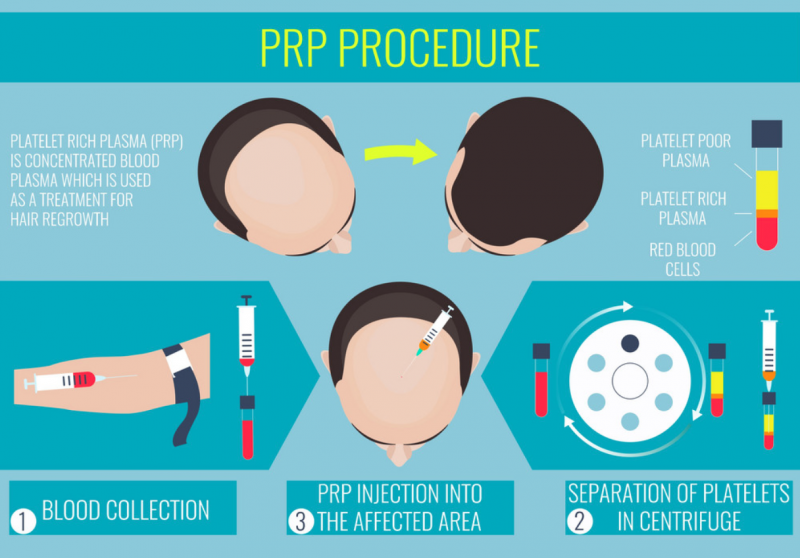 Once spun, the PRP is collected, activated and then injected back into the scalp using a small needle. 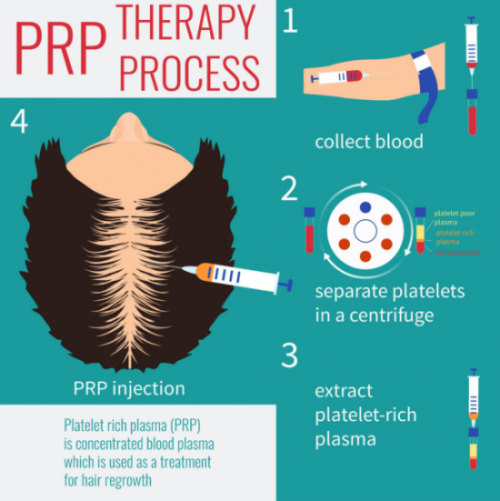 PRP contains special cells called platelets that can aid in growth of the hair follicles by stimulating the stem cells and other cells in the microenvironment of the hair follicle. These special platelet cells promote healing, accelerate the rate degree of tissue healing and regeneration, respond to injury, and promote formation of new cellular growth. The primary purpose of using PRP in hair restoration is to stimulate inactive hair follicles into an active growth state. A Variety of Growth Factors Released from PRP Rejuvenate the Skin from Inside. PDGF (Platelet Derived Growth Factor) – Cell growth, new generation and repair of blood vessels, collagen formation. FGF (Fibroblast Growth Factor) – Tissue repair, cell growth, collagen production, hyaluronic acid production. EGF (Epithelial Growth Factor) – Promotion of epithelial cell growth, angiogenesis, promotion of wound healing. VEGF (Vascular Endothelial Growth Factor) – Growth and new generation of vascular endothelial cells. TGF-B (Transforming Growth Factor) – Growth and neogenesis of epithelial cells, vascular endothelial cells, and promotes wound healing. Why Choose PRP For Hair Loss? 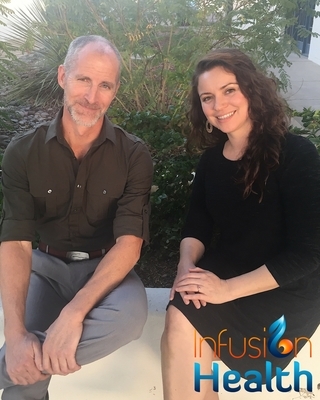 Here at Infusion Health IV Lounge, we proudly offer Platelet Rich Plasma (PRP) as a proactive therapeutic option for male and female patients experiencing hair loss. Studies published over the last 10 years show PRP hair injections to be an effective, non-surgical treatment for regrowing hair. PRP has a low risk of allergic reaction or side effects because one’s own body makes the platelets. Once administered, PRP helps to stimulate growth factors, which trigger the hair follicles to grow and restore hair density. PRP is typically is done once a month for six months. After one year, the patient will come in for a re-evaluation. Infusion Health Iv Lounge offers various adjunct therapies to maximize your hair growth. Talk to your doctor about with treatment options are right for you. These can include topical prescriptions, peptides, and other. New patients will be scheduled for a 30-60 minute office visit to establish care, discuss goals and review treatment options. After you and your physician establish a treatment plan, the procedures can be scheduled. The PRP injections require less than half and hour. A blood draw will be scheduled prior to the procedure to allow to concentrate your platelets. Once ready, a delicate 30 gauge needle is used to administer your own platelet rich plasma into the areas of on the scalp where there is hair thinning. * You might experience localized redness and a slight headache after the treatment. This resolves quickly.